Linux and GNOME user, full time, since 2001. Actual maintainer of GXml and contributor to other projects mainly on GObject Introspection support. Yes is time to consider a Vala 1.0 release. Vala 0.34 code generator and bindings support LTS versions of GTK+ 3.22 and GLib 2.50. Next stable version of GTK+ will be 4.0 and GLib 2.x, but they have to traverse through 3.9x versions and any GLib 2.x on the way. Reaching that point we can consider Vala 2.0 release. Traditionally a new Vala version is released along with GLib and GTK+, with bindings updates, from them and other projects. Some times, is necessary to change some Vala syntax or implementations, like threats, in order to be in sync with current GLib/GObject/GIO features. Because this, may we can consider to increase Vala API each stable version of GTK+. In order to reach Vala 1.0, may we should identify stoppers bugs before to go. Some of them can be related to GNOME Builder, but may is not a real problem is you don’t use it for Vala development. I really would like to file, find and send patches for some of them, producing warnings at C compilation, for a better experience. A road map could be stated at Vala’s Wiki, in order to track that stopper bugs/features to fix/implement before 1.0 release. This will mark a good stand point for any developer using Vala. Debian is around corner. It supply Vala 0.34, then it should be considered, and backport fixes, as a LTS version. Author despinosaPosted on February 14, 2017 5 Comments on Vala 1.0? Vala provides you a way to write C/GObject/GInterface code using a different syntax. Vala doesn’t require to develop a “core library” in order to provide its features. Its “compiler” is not a compiler, is a C code generator. Vala can’t be compared with Rust, Go, Python, Java or C#, all of them provide their own “core library” in order to provide most of their features, allows you to create modules (like a library) to extend the language for their users consume. Their core generally is written in C, for very basic features, but almost in the language itself. Vala is different in many different ways to other real programming languages. Vala can’t exists without GLib and GObject. It just wraps that libraries to provide its Object Oriented syntax. It doesn’t provides any feature by it self, just a syntax to use the ones already present in above libraries, a part to provide some convenient methods to reduce coding boilerplate. GLib, GIO and GObject are C libraries. They are the basis for GNOME, GNOME Shell and any other application using GNOME technologies. GTK+ and any library or application using it, relays on above libraries, they can’t exists without them. VMWare and LibreOffice consume GTK+ and so GLib/GObject. Vala provides mechanism to create bindings. They are conventions to help Vala’s code generator to produce correct C code to consume any other, apart of GLib/GObject, libraries. It can do better job if the library use GObject. Vala is not a Language: This is a conclusion after the On Vala article, comparing Vala’s repository’s activity with other real languages. May we need to add to Vala’s activity, all commits and developers on GLib, GObject, GTK+ and GObject Introspection, because they are, indirectly, supporters of Vala’s features and usefulness; may be we need to consider all other libraries’ activity, like libsoup, libgda, and any other one supporting GObject Introspection, because they can be consumed by Vala; this is specially true if we consider their support to generate, automatically, Vala bindings. Considering all of these, if Vala was a real language: it can be considered to be one with a very reach, secure and stable “core”, with years of development behind; with a reach set of other libraries for your use, as a developer, to choose from. But again: Vala is not a Programming Language. Vala is multiplatform as long as its Code Generator and their libraries it depends on, or can bind, are present in your target platform: Windows and OS X, are just examples. May is time to update Vala’s README and vala.doap at git.gnome.org, in order to avoid missunderstandings. With lot of work to do on XSD, but certainly happy to see GXml.Gom* classes taking shape, fixed lot of bugs since last 0.13.2 and starting to port some projects to this new version, I hope to soon release 0.14, just after most translation are in place. This new version, will provide a better supported XML GObject wrapped, using DOM4 API and initials of other technologies like XPath and XSD. Hope some one takes some time to implement XPath recent W3C specification and complete XSD support implementation. May be this will be a good projects for Google Summer of Code 2017. On the process, I’ll try to implement W3C SVG API using GXml.Gom* classes, to provide a fully supported XML/SVG API using GObject libraries, and all other languages supported by GObject Introspection. Cleanup more interfaces/classes no useful any more, like TNode derived classes and other non DOM4 compliant interfaces. This will reduce number of classes to choose from, while recommend way will be on GNode and GomNode derived classes. May be other ideas, from GXml users. I love GInterface definitions, more in Vala, because they are clean an easy to describe API. Interfaces are the way W3C defines their specifications, like SVG and DOM4. Vala interfaces definition are realy close to be a copy and paste from W3C’s specification definitions. With some, well a bit, work, you can transform them in usable GObject Interfaces definitions. GXml take DOM4 interfaces and implement them, using a set of instantiable classes. GXml provides a GObject to XML and back serialization framework, allowing you to define your own classes and how you want your data is represented in XML. In order to read back your information, GXml needs to create, on-the-fly, instances of your classes, this means you need GObject ones no GInterface. Starting to implement XSD support in GXml, I’ve created a set of interfaces to interpret W3C specification, this is really helpful, but unusable when you need to instantiate an object it is declared as a Interface. For example, if you have an interface A and it has a property of type B, but at the same time B is a GInterface, you can’t implement A and have an instantiable object from B: I mean, using g_object_new(). Because GXml engine, requires instantiable objects, to create new element nodes when found, using a GObject type to parse attributes to properties, for example, I ended creating a set of interfaces, to help me design an clean API, makes room for other implementations engines, but creating a new classes that will implement XSD interfaces having its own “mirror” properties. This is, while GXml.XsdSchema have a GXml.XsdListSimpleTypes property to access to all simple type definitions, GXml.GomXsdSchema will have two properties with same purpose: a GXml.GomXsdListSimpleTypes property AND a property of type GXml.XsdListSimpleTypes to fully implement GXml.XsdSchema. Second one, will mirror the first. These is more work to implement an interface but keeps your classes’ properties instantiable, and your users can choose to use just GXml.XsdSchema interfaces API to access your class implementation, keeping open to use different implementations. Best of all, with GXml implementation of XML to GObject, more clearly using GXml.Gom* classes, you will have access to *all* nodes, attributes and child ones found in an XML file, without loose them in the process of de-serializing back to your class instance. While on the road to release GXml 0.14, I started to port some of my projects to new GXml.Gom* objects, in order to take advantage on speed and reduced memory footprint. In the process, my library requires to define a large set of strings to select on for an element’s attribute. This is, PostalCode number. They are defined as XSD enumeration in a SimpleType. At the begining, I started to define an array to add to GXml.GomArrayString, but found they are too many to maintain and error prone. Then I desired to take a look at W3C Schema Specification and started to define a new GXml.Xsd* interfaces and a new GXml.GomXsd* classes to implement them. The result is: GXml.GomXsdArrayString , a new class taking an XSD file, to search a SimpleType definition and parse all enumerations, add them to an array of strings you can choose or validate your property value from. These are the first steps in the way to get XSD support in GXml. While, GXml.Xsd* interfaces are unstable, and will continue this way after 0.14 release, will open new opportunities to any one consuming XSD definitions. May be in the future, some one can use this API to create an XSD to Vala (or C) code GObject classes. May other wants to help adding more object definitions from XSD specification in order to get patterns and other restriction from schema definitions, and improve data handling and validation. In upcoming GXml 0.14, there will be a new DOM4 implementation called GomDocument, it along with GomElement and GomObject, provides support to serialize or deserialize GObject object to or from XML files. 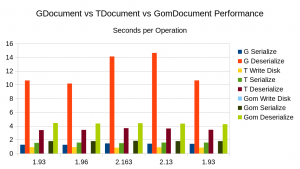 I’ve made initial measures about what is the performance of GomDocument against other implementations in GXml: GDocument and TDocument, first one is a libxml2 implementation with bidings on GObject and DOM4 while last one is a pure GObject implementation with no support (yet?) of DOM4. In performance test, we use a 3.5 MB file with a lot of nodes, read it and then create an internal in memory XML tree and then fill out your GObject class properties, we measure required time to deserialize and then time to write it back to an XML file. We can see GDocument taking a lot of time on deserialize, because it uses libxml2 to create a tree and GXml.SerializableObjectModel to fill out your GObject class. Serialize is very competitive, because all implementations, use almost same engine: direct access to libxml2 by xmlWriter. 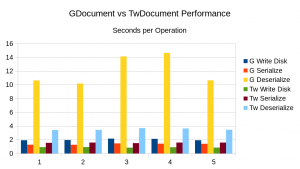 GomDocument, is very competitive if compared to TDocument, but can perform much better than GDocument. Please note that GomDocument time to write to disk is not available, because serialization and deserialization is make in one go, then may be we case reduce this time (should be the same from others because the file is loaded in memory before to read) and then this makes GomDocument to perform even better!! 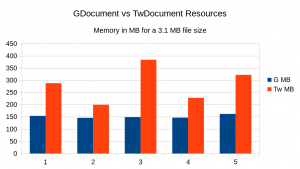 On memory usage, TDocument requires much more memory and GDocument is the one to defeat. GomDocument now requires almost same memory than GDocument. GomDocument is the way to go on Serialization framework for GXml. These results will help LibreSCL, to provide a very competitive serialization/deserialization framework and consider to create a WEB based application using GObject Introspection and Python to access very large files, without requiring lot of memory resources and may be a good response time on reading. I’m starting to stabilize GXml to release 0.14 as soon as I can found most bugs on parse XML files. GXml’s GomDocument have a set of errors detection, based on DOM4, not present in other GXml implementations, making it more sensitive to some files and may not affecting (or detected) by libxml2, for example. Now you can convert your GObject classes in XML nodes. This is, you can read and write XML trees directly to object classes’ properties, from basic types to complex like object properties, representing XML element’s attributes, to other child elements, while you can use collection of child nodes. This has been easiest to implement than GXml.SerializableObjectModel, which requires you to read an XML tree and then translate to your object properties. This should be slower than new GOM implementation included in this release. Next, should be to test it in a real project like GSVG and make some performance tests. These are old results of GDocument vs TwDocument, used by SerializableObjectModel, to serialize and deserialize large files (3.1MB). 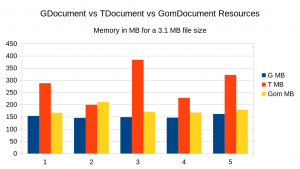 In future articles, hope to attach this GomDocument performance and resources comparations with all existing implementations in GXml. In GXml GOM, any GomElement is an XML Element node. If it has GomElement as properties, they will be added as child nodes. If your GObject class implements GomProperty interface, and is a property in your object, it will be translated to an Element attributes with a name and a text value. For simple types, this means you can control if an attribute is written or not, depending if it is not null. Standard properties, not GObject classes implementing GomProperty, they will be always written with its default value. This is, for example, a boolean will always use false by default. Using GomProperty, you can define default actions when a property is omitted in XML file. With GXml GOM, is now possible to implement W3C SVG 1.1 specification interfaces, most objects will be complex properties to be translated to Element’s attributes. Once you implement a way to parse a string representation to your object’s properties and back, you can have GomProperty objects in your GomElement to be de/serialized to attributes. GomElement objects are containers, by definition, in DOM4. It can have child nodes of different local names and namespaces. Once you have a set of different nodes, may you want classify them by their node’s names and for, for example, its id attribute. GXml GOM, have added a set of basic collection classes, implementing GomCollection interface. ArrayList and HashMap, are classes you can use to access child nodes. All references are to child node’s indexes, no copy or ref-counted objects. If you want to see how implement different kind of classes and properties, you can checkout GXml repository Unit Tests. Now with all in place for DOM4, GXmlGom is getting support to derive classes from GXml.GomElement, making easy to serialize your GObject classes to XML. Now you just need to prefix your GObject’s property nicks with “::” and it will be used as XML Element attribute. Now Gom have support for strings, integers, unsigned integers, double and enumerations properties types. Next steps will be to implement reading XML documents back to your GObject’s properties. You will find more “examples” and advances at GXml repository. This post is based on my experience on not just using but creating and maintaining Vala libraries. Rust is on the horizon and have voices to use it instead Vala. For Vala, we can say, is true to be niche oriented language, because it just create GObject based applications and libraries. For Rust, it has a more general purpose, with save concurrency and save programming: true again. I have downloaded Rust to start using it, because seems to be very convenient for C development replacement, specially may be suitable to replace old libxml2 library, hopping some some have started to write an XML parser and writer, I can re-use in my own projects. After taking a time to check at Rust documentation and write a post about GObject and Rust, I would like to share my thoughts about Vala and Rust. Vala have a very specific target: GObject. We can use Vala to create GObject classes and define API interfaces using GInterface, but in a sugar and very productive syntax. Doing Object Oriented Programming using Vala and GObject is easy and natural. I’ve managed to get W3C set of API interfaces based on specifications for DOM and SVG, because Vala provides a kindly close interface definition syntax to the ones from W3C. Implement them have been a matter of, you know, work. W3C interfaces are really complex in a way of their relations ships and dependencies, which should be very difficult to implement if doing in C and GObject/GInterface. This is not false for Rust, because it doesn’t have a GObject/GInterface mechanism, at least not jet. In my opinion, Rust should develop its own, more powerful and secure, implementation of GObject/GInterface, based in their own internal types, like Traits. I don’t know if Rust is planning to provide an Object Oriented like mechanisms, like GObject/GInteface, with properties, signals, introspection and inheritance, but is very convenient for other languages and implementing Object Oriented API, like the ones from W3C. While I write this article, I’m studding Rust, to find equivalences and possibilities, thinking on how to port my work to Rust if possible. At least, for now, I can’t, but I have been just little time, I need to follow its development and road map. Vala development can be used by Rust applications and libraries, because is C and GObject, and because it produce GIR files to create bindings easily for Rust, along with other languages. If GObject is your choice to write your next library or Application, I can recommend to use Vala: you’ll get a very productive syntax and a easy bindable API. No, I’ve don’t want to stop my self to Vala. Just is very convenient to produce GObject based libraries, use any C based library too, and is really productive. My work on GXml, can’t be just dropped and its capabilities to Serialize GObject classes, by introspection of its properties, are very useful and productive. I’ll share more in these later.